Google's philanthropic arm, Google.org, said the investment would go toward enhanced geothermal systems (EGS), a technology that circulates water through hot rocks in the ground, producing steam to power a turbine. Conventional geothermal technology relies on finding naturally occurring pockets of steam and hot water below the Earth's surface. "This is an exciting new approach to geothermal that could meet thousands of times US energy needs," Dan Reicher, head of climate and energy initiatives for Google.org, said in an interview. "It's 24-7, it's potentially developable all over the country ... and for all that we really do think it could be the 'killer app' of the energy world." "Killer app" is a tech term used to describe revolutionary software. Geothermal technology is a good complement to solar and wind farms, Reicher said, because their electricity output is intermittent. Google's investment includes US$6.25 million for Sausalito, California-based EGS company AltaRock Energy Inc, part of a US$26.25 million round of funding AltaRock announced on Tuesday. Other investors include Microsoft Corp co-founder Paul Allen's investment firm, Vulcan Capital, and Silicon Valley venture capital firms Khosla Ventures, Kleiner Perkins Caufield & Byers and Advanced Technology Ventures. Google will also invest US$4 million in Potter Drilling Inc, a Redwood City, California-based company that is developing deep hard rock drilling technology for use with EGS. The company also announced a US$489,521 grant for Southern Methodist University's Geothermal Lab to update geothermal mapping of North America. Last year, Google said it plans to spend hundreds of millions of dollars to help drive the cost of electricity made from renewable sources below the price of power generated from dirty coal-fired plants. The company is focusing its efforts on three technologies: solar thermal, advanced wind, and EGS. It has previously invested in Pasadena, California-based solar thermal company eSolar Inc and Alameda, California-based high-altitude wind company Makani Power Inc. According to a recent report by Business Week, the costs of cooling data centres and providing them with operational power is growing, leading Iceland to become a forerunner in the industry. The North Atlantic nation is currently courting Google and Microsoft to try and lure them across the Atlantic to where energy is inexpensive and the climate somewhat cooler. 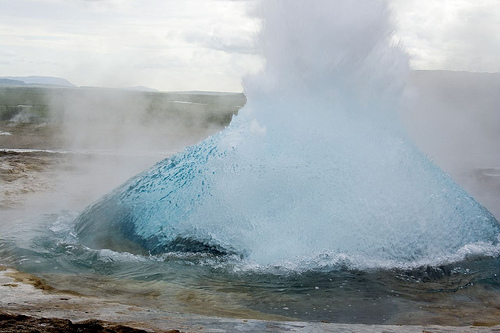 Iceland offers cheaper operating costs for data centres because of the abundance of hydroelectric and geothermal energy, undeveloped land and a climate which makes cooling considerably more cost-efficient than in the US. Business Week reports that the cost of the energy required by data centres in the United States has doubled between 2000 and 2006. The US government predicts that the $4.6 billion expense could double again in the next three years. The growing need for power coupled with its rising price has led corporations to seek out more creative solutions. So far Google, Microsoft and Yahoo! are among the many international companies who have expressed interest in establishing data centres in Iceland. Business Week predicts that data centre energy efficiency may be the determining factor in the dominance of either Microsoft or Google in the Internet search business.